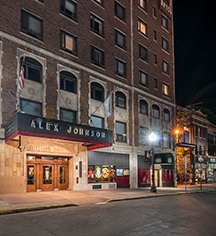 The historic Hotel Alex Johnson has long been known as one of the most haunted hotels in South Dakota. From the Lady in White to the ghost of Alex Johnson, there have been countless reports of spooky activity. The SyFy Channel’s hit show Ghost Hunters traveled to Rapid City to do a special segment on the hotel and the investigators reported that they experienced significant paranormal activity throughout the hotel. 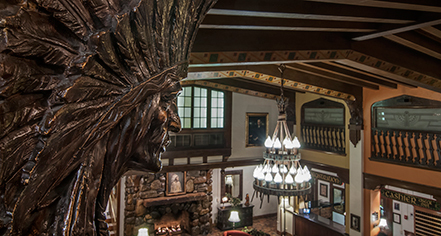 The most popular and reported ghost story of Hotel Alex Johnson is that of the Lady in White. During the 1970s, it was reported that a young bride committed suicide in room 812. Those that knew the young woman insisted there was foul play, stating that she was much too happy and friendly to commit such an act. The fact that she was to inherit a large sum of money only strengthened their argument. Yet, no one was ever convicted of her murder and the suicide ruling stood firm. Today, guests claim the young bride wanders the halls of the eighth floor in a white gown, searching for those responsible for her death. It has been reported that the window of room 812 is often found open in the morning and that dresser drawers are taken out, turned upside down, and put back in place. Some guests have reported seeing the ghost of Alex Johnson himself. It is thought that since his death in 1938, he has stayed on the premises to ensure operations are still running smoothly. Some guests of the eighth floor of the hotel have reported that the ghost of a young girl would knock on their door, night after night, only to disappear in the hallway. She's also been heard giggling down the hallway.